I used to LOVE that thing! Never had an inchworm. 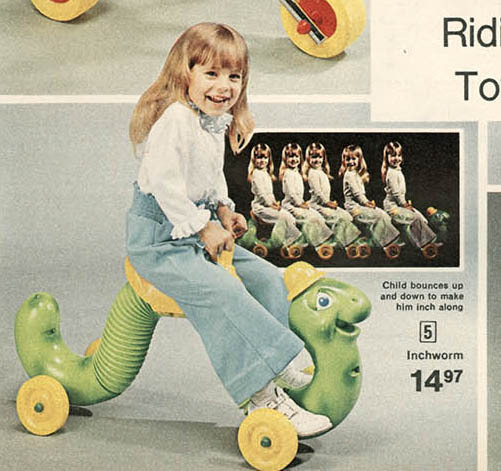 I loved my big wheel though. I rode that thing even if I couldn't sit in it. I would just stand and roll down the hill. 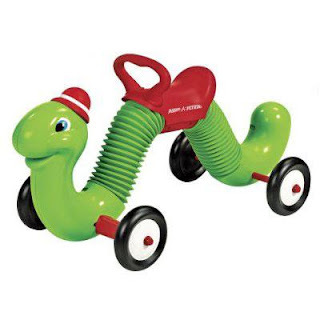 I forgot about inchworm. Don't think I had one, but seeing the old ad made me remember a bit; I think a later ad had a more lively version of the song. OMG- I LOVED that thing! Thanks for the reminder! I think that I remember seeing this at a playgroup when I was a kid, but couldn't ride it because of my weight, as they feared that I might break it. But I can see why young girls might've enjoyed riding this as they bounce up and down.